Parakeets enjoy getting out of their cage every now and then and flying around the house for exercise and enjoyment. While this is a good activity for them, several houseplants are toxic to budgies. The birds have a natural curiosity, as well as a proclivity to foraging and nibbling on greens. Some houseplants are safe for parakeets, at long as they of free of pesticides and chemicals. Tubular nasturtiums (Tropaeolum majus) grow well as houseplants. They are safe for parakeets to chew on, and the birds may enjoy the flowers. The plant has lobed grayish green leaves that are approximately 2 to 5 inches in diameter, and grows to be up to 6 to 7 feet in length. It flowers in midsummer with five-petaled russet, pink, yellow, orange or crimson blooms that are 1 to 2 inches in diameter. The flowers are frequently used in food, including salads, soups and cheese spreads. They have a peppery taste, similar to arugula. Your budgie may enjoy the flowers cut into small pieces and served in a bowl, or it may prefer to cling to the plant and nibble them free form. African violet (Saintpaulia) is a flowering houseplant safe for parakeets. The leaves of the plant are textured with ruffles or scallops, and some budgies enjoy eating them. African violets bloom with flowers that are either single and star-shaped, or double and fringed or ruffled. The flowers come in many colors, including blue, pink, red and white. African violets are easy plants to grow and do well in small spaces. Place African violets in indirect sunlight and water to keep the soil moist, either from the top, applying water to the surface, or from the bottom, by filling a saucer with water and placing it under the plant. Boston fern (Nephrolepis exaltata ‘Bostoniensis’), sometimes referred to as Sword Fern, has its origins in Florida. It has 3- to 4-foot long erect fronds, and is grown in pots or hanging baskets. Boston ferns are safe for budgies, and the fern foliage stimulates foraging behavior that the parakeets have in the wild. Boston ferns grow best in a well-drained soil that is kept moist at all times. Although they have a high tolerance for changing light levels, do not place the fern in direct sunlight. 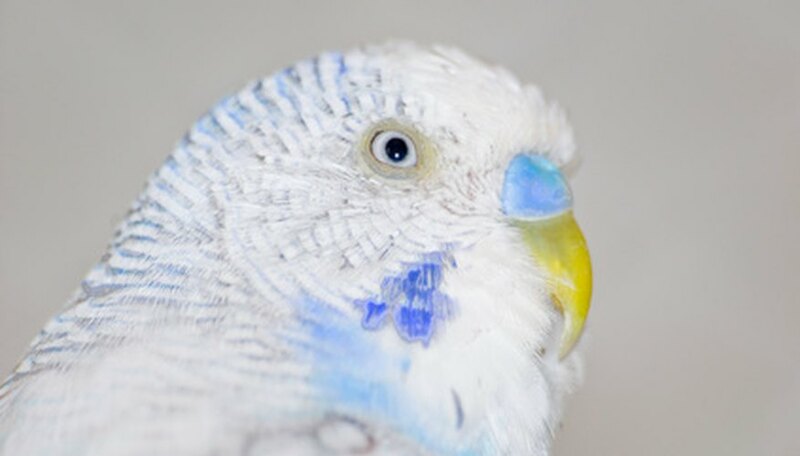 Monitor your budgie’s activities; they enjoy ferns, and may nibble a fern to stubs in no time. The exotic-looking Spider plant (Chlorophytum comosum) is a favorite houseplant. Easy to care for and easy to propagate, it is also a safe plant for parakeets that often enjoy playing in its foliage and chewing on the leaves. Spider plants make attractive hanging plants and serve well as a landing site for flying parakeets. The plant has recurved medium-green leaves with a broad white stripe in the center. They thrive in indirect sunlight, and do best in soil that is evenly moist.